Consider a set of N+1 equidistant atomic planes of spacing d, and a monochromatic plane X-wave falling on it at a glancing angle θ (Fig. 6-1(1)). It is assumed that each atomic plane reflects a very small fraction of the incident amplitude, small enough so that the weakening effect of this reflection on the incident amplitude may be neglected throughout the crystal. Under most angles of incidence, θ, the waves reflected from neighbouring planes will show a phase difference, and where all the reflected waves come together at great distance from the crystal, the superposition of these waves of systematically increasing phases will lead to a cancellation of amplitudes and to optical field zero. There exists, then, only the transmitted wave. If, however, the phases of all the reflected waves arrive within less than one half wave-length phase difference, then all reflected amplitudes will build up together to an optical field in the direction of reflection, without any actual cancellations of contributions. Should all waves arrive in the same phase, then full re-inforcement of the waves takes place to an amplitude of N+1 times that of the single reflected wave. Fig. 6-1(1). Bragg reflection on a set of N atomic planes. This 'Bragg Equation' determines the angles θn under which the first, second, third, . . . order reflections occur, for n = 1, 2, 3, . . . The greater the wave-length, the larger the glancing angle for reflection on the same plane; the greater the spacing, the smaller is the glancing angle for a given wave-length. If λ is known and θn measured, then the value of n/d follows, and if the order can be found, the value of the spacing of the set of reflecting planes is determined. By putting together the information on various sets of reflecting planes, obtained in this way with the X-ray spectrometer, the first crystal structure determinations were made. If we plot the reflected amplitudes as a function of the difference of the angles of incidence and reflection from the Bragg angle, φ = θ - θn, each Bragg angle is seen surrounded by zeros of the reflected amplitude and corresponding zeros of intensity obtained by squaring the curve. The principal or zero order maximum lies between the zeros for s = ±1 and has therefore a width of (2 tan θn)/N. Fig. 6-1(2). 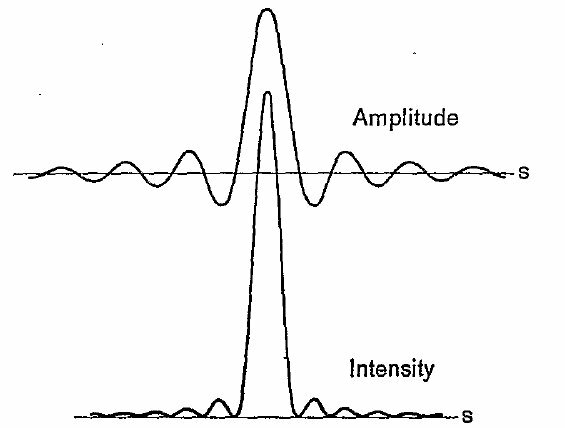 Amplitude and intensity curve of the wave reflected by a set of N atomic planes in the neighbourhood of the Bragg angle. The finite angular width of the Bragg reflection is a consequence of the limitation of thickness of the crystal to Nd. The thinner the crystal, the wider is the angular range of the principal maximum, and the poorer is the resolving power of the crystal as an optical instrument for distinguishing between neighbouring wave-lengths in spectroscopy. The total reflected intensity in any order of reflection is proportional to the area under the principal maximum of the intensity curve. Since the amplitude maximum is proportional to N+1, or essentially to N if this is large, the maximum intensity is proportional to N2. With the width of the principal maximum given above, the total reflected intensity is then proportional to 2N tan θn. This shows that the reflected intensity is proportional to the thickness or volume of the crystal, - a result that is true only as long as the crystal is so thin that the reflection leaves the incident, and transmitted, ray at practically its full strength. The consideration of the secondary maxima and of the finite resolving power of the crystal is essentially what H. A. Lorentz introduced into the theory, although using Laue's diffraction, not Bragg's reflection language. The measurement of the angular width of the principal maximum of reflection forms the basis of the determination of particle size by means of X-rays - in the particular case considered the thickness of a crystal flake could be determined from such measurements. 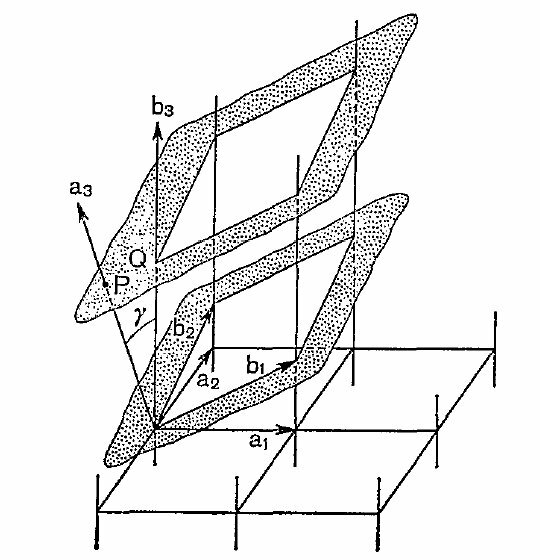 Bragg's formula can be applied to reflections on atomic planes which are not parallel to the crystal surface, because the condition of re-inforcement does not contain the orientation of these planes to the surface. 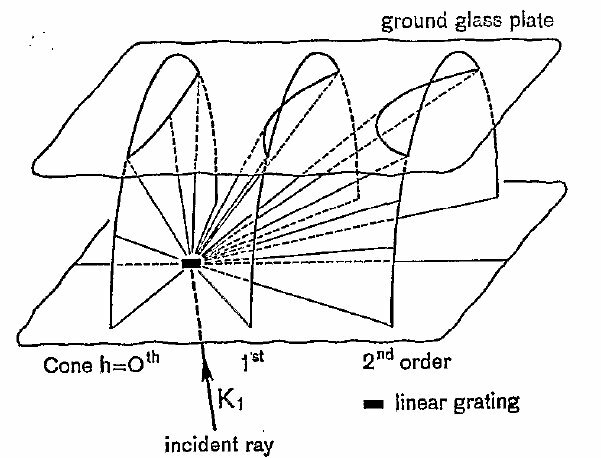 If a small general refraction of X-rays in a crystalline medium is taken into account, λ and θn, in the formula have to be interpreted as the internal values which are related to the values outside the crystal by the ordinary laws of refraction. Since the refractive index for X-rays differs from 1 only by about one part in hundred thousand, this refraction need be considered only in measurements of very high precision; it was first found by W. Stenström of M. Siegbahn's school in 1919, and leads to a correction of wave-lengths or lattice constants when the usual Bragg formula is applied within the above range of accuracy. The great simplicity of Bragg's theory is achieved by the introduction and use of the spacing d of the reflecting planes. Starting from the axial system, or the cell of the crystal, the determination of d for different kinds of planes requires some geometry. On the surface Laue's theory appears more complicated, but it contains this internal geometry of the crystal as it were built-in. There were, besides, some objections to Bragg's idea of reflection which, in the early stages, made its acceptance not obvious. While densely populated planes of atoms are well defined, with wide spacings between them, the sparsely populated planes have little physical reality. Their spacing must be very small, in order to produce the fixed number of atoms per unit volume. Therefore it seems rather artificial to consider with Bragg that the few atoms on each plane reflect like a mirror, independently of the much closer atoms which belong to neighbouring parallel planes. Furthermore the regular arrangement of the atoms in any one of these planes is known, from the diffraction point of view, to produce many diffracted rays (cross-grating spectra), of which the specular reflection is only one. What becomes of the others? k·x = |k|·|x|· cos(k, x). 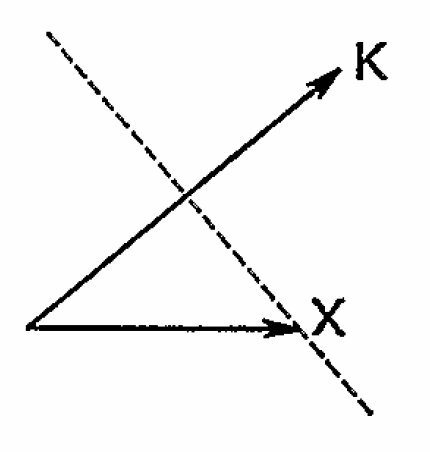 Now |x| cos(k, x) is the length of the projection of x on the direction of k; this projection is often called the resolved part of x along k. Evidently the resolved part is the same for all points x lying on the dotted line of Fig. 6-2(1), and, in three dimensions, for all points of the plane normal to k which contains the dotted line. Therefore the expression k·x = constant can be used to describe the planes of equal phase of a wave. The value of the constant is the length of the optical path, expressed in wave-lengths, from the wave front passing through the origin to that passing through point x. The argument (-νt + k·x) is characteristic of a wave of frequency ν travelling in the direction of k; ν/|k| = q is the velocity with which the phase travels. Fig. 6-2(1). Scalar product of wave vector and coordinate vector. Fig. 6-2(2). Diffraction by linear grating (row of atoms); difference of optical paths through neighbouring atoms. By putting h = 0, a solution of this is seen to be k = k1; that is, there always occurs optimum re-inforcement of the wavelets in the direction of incidence. To the right of this direction (in the above figure) lie the directions with positive integers or 'orders' h, to the left those for negative h. The values of h are limited by the condition that the diffracted waves have to move away from the row of atoms. The fact that the individual scattered wavelets are spherical will make the result of their superposition the same in all planes containing the row of atoms. The direction of k is therefore only the representative of a cone of directions surrounding the row, and maximum amplitude is achieved in all directions of observation along this cone. 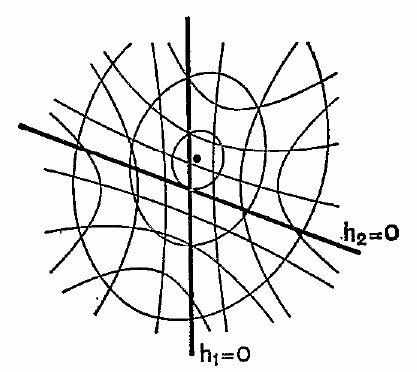 If we imagine the rays issuing from the row of atoms to be made visible by their intersection with a ground glass plate which is parallel to the row, the result will be a series of bright hyperbolae as in Fig. 6-2(3); the same pattern would be obtained on a glass plate placed beneath the row - or, in fact, on any plate held parallel to the row. Fig. 6-2(3). Diffraction by linear grating shown on ground glass plate in physical space. To this first description of the directions of difIraction in relation to the row of atoms we now add a second description in a 'reciprocal space'. We take from equation (2) the following instruction for finding the direction of the wave vector k of a diffracted wave, given the direction of the wave vector k1 of the incident wave: make the resolved parts of the two vectors with respect to the translation a such that they differ by a multiple (h) of 1/|a|. To this end we construct a series of equidistant plahes normal to the row of atoms and with spacing 1/|a| between them. If the given wave vector k1 is laid down so that it ends in the origin 0, its starting point T is determined. If now from T we draw any vector k ending on one of the planes, say that labelled h, then condition (2) is fulfilled and all wavelets arrive at a distant point in the direction of k in the same phase. But in classical scattering there is no change of wave-length; therefore |k| = |k1| = 1/λ. This means geometrically that the end-point of k must also lie on a sphere about T of radius 1/λ, i.e. which passes through the origin. This 'sphere of reflection' is intersected by the set of planes in circles, and these are the geometrical loci for the ends of the diffracted wave-vectors. Connecting T, which will be called the 'tie-point', to all points of the circle in the plane numbered h, one obtains the cone of diffracted directions of order h, as in Fig. 6-2(4). Fig. 6-2(4). Diffraction by linear grating shown in reciprocal space. In this construction the distances at which the planes are drawn represent 1/|a|, and the radius of the sphere of reflection is 1/λ; thus we are using a space in which the distance represents the inverse of a length in physical space and is measured in cm-1 or 1/Å (= 108cm-1). There is nothing more unusual in this than if we represent, for instance, a velocity [cm/sec], force [g·cm/sec2] or an electric field strength [volt/cm] by the length of an arrow in a suitably labelled space. The space we are operating in above is called 'reciprocal space' because the product of a length in this space and a length taken in physical space is a dimensionless quantity, i.e. a pure number. We shall now extend the same two representations of the directions of diffraction, in physical space and in its reciprocal, to two- and three-dimensional lattices of atoms. We visualize this condition with the help of the ground glass plate of Fig. 6-2(5) which we imagine to be parallel to the plane of the cross-grating. Each of the above equations is fulfilled along the hyperbolic intersections of the plate with the cones surrounding the directions of a1 and a2. The directions for which both conditions are fulfilled are those leading to the points of intersection of the hyperbolae. Each diffracted ray is named as a two-digit 'order', (h1, h2), the integers of which tell the whole number of wave-lengths path difference of the wavelets scattered by an atom and its neighbours along a1 and a2. Cross-grating spectra always exist, for any wave-length or angle of incidence. Should a2 be considerably larger than a1, then the second set of hyperbolae have a much narrower spacing than the first, and the points of intersection mark out the first set very clearly. Starting out from the central spot which gives the direction of the incident ray and has order (0, 0), one can easily 'index' the diagram by assigning each point its (h1, h2) values. Fig. 6-2(5). Cross-grating diffraction shown on ground glass plate in physical space. The spherical wavelets combine equally on both sides of the cross-grating; a second ground glass plate beneath the grating would show the same design. To the transmitted beam on the upper plate corresponds a reflected beam on the lower plate, and this has again the order (0, 0). These two beams (0, 0) are always present, whatever the atomic distances, or even their regularity may be. Let us now look at the corresponding construction in reciprocal space. The first of the two conditions (4) leads to the set of planes normal to a1 with spacings 1/|a1| between them which we know from Fig. 6-2(4). The similar set of planes representing the second condition (4) is normal to a2, with spacing 1/|a2|. Both conditions are simultaneously fulfilled on the intersections of these sets, that is, on a periodic array of straight lines normal to the plane of a1 and a2. Additional to this, the condition of scattering without change of wave-length requires that the vector k of a diffracted wave end on the sphere of reflection of radius |k1| and centre at T. The wave-vectors kh1,h2 of the diffracted waves therefore start out from T and end in the points of intersection of the sphere of reflection with the straight lines of orders h1, h2. Provided the radius of the sphere of reflection is not too small, intersections will always exist on the upper and lower hemisphere, corresponding to the cross-grating spectra of the same orders emitted to both sides of the cross-grating, as explained above. Fig. 6-2(6). Left: cross-grating in physical space; upper right: pattern of cross-grating spectra in physical space; lower right: trace of the planes normal to a1 and a2 for construction in reciprocal space. Fig. 6-2(6) illustrates the cross-grating with translations a1 and a2, and its relation to the pattern of crossed hyperbolae in physical space; it further shows in reciprocal space the ground plan of the sets of planes normal to a1 and a2, and the distribution of their lines of intersection. The area of the parallelograms between these lines can be transformed into a rectangle whose one side is 1/|a1|, while the other (vertical) side is 1/(|a2| sin α), where α is the angle formed by a1 and a2. Thus the area is 1/(|a1||a2| sin α), and this is the inverse of the cell (or parallelogram) of the cross-grating. These are the conditions which Laue gave, in slightly less condensed form, in his first paper on the subject (cf. pg. 50 for Laue's form of the equations). What does the third condition add to the first ones in the two geometrical representations? The ground glass plate of Fig. 6-2(5), which is parallel to the plane of a1, a2 will be intersected by a3. For clarity we may assume the direction of a3 to be sufficiently steeply inclined to a1, a2 so that the cones surrounding a3, which represent the third condition (6), intersect the glass plate in ellipses; if a3 is normal to the plate, the intersections will of course be circles. For all three conditions (6) to be fulfilled simultaneously, an ellipse or circle must pass through an intersection of the hyperbolae (Fig. 6-2(7)). This will in general not occur, except for the direction of incidence, and then the incident wave will travel through the crystal without being diffracted. However, as we decrease the wave-length, the cross-grating pattern contracts towards its centre, the direction of the incident ray, and the ellipses or circles contract about the point where the axis a3 intersects the plate. These contractions take place at different rates, and this means that for certain wave-lengths three curves intersect simultaneously and a diffracted ray of order (h1, h2, h3) flashes up. This is the pass-filter action of the crystal for white X-radiation, since, given the direction of incidence, only a certain wave-length can appear in a diffracted ray, other wave-lengths not being admitted at this particular angle of diffraction. This statement has to be modified, however, because by multiplying the lengths of k and k1, as well as the order numbers hi by the same integral factor n, the equations (6) remain fulfilled without change of direction of k or k1. In other words, if a wave-length λ is diverted by diffraction into a direction k, then λ/Z, λ/3, . . . can be contained in the same direction by diffraction at correspondingly higher orders, provided, of course, these shorter wave-lengths are contained in the spectrum of the incident white radiation. This multiplicity of the wave-lengths in the spots of Laue diagrams makes these less suitable for crystal structure determination than the diagrams obtained with monochromatic radiation. Fig. 6-2(7). Diffraction by three-dimensional lattice shown in physical space on ground glass plate. The ellipses represent the third condition of re-inforcement of the wavelets. In reciprocal space, the third of the conditions (6) adds a set of equidistant planes normal to a3, and of spacing 1/|a3|, to the array of straight lines representing the first two conditions. The intersections of these lines or rods with the planes yields a three-dimensional lattice of points called the 'reciprocal lattice'. The condition of diffraction is now that the sphere of reflection intersect a point of the reciprocal lattice. Again, with the direction of incidence and the wave-length given, - in short, given the tie-point - ,the chances are that the sphere of reflection will not pass through any point of the reciprocal lattice, except the one at the origin through which it passes by definition. If this is so, only the 'primary' beam (000), the continuation of the incident beam, is formed and there is no diffraction in the usual sense. If, however, we vary the position of the tie-point in any way, the sphere of reflection will sweep over some of the lattice points, and every time such intersection occurs, a diffracted ray will be flashing up. In the Laue method the direction of incidence is fixed, but the length of the vector k1 is variable, inversely as the wave-length; therefore the tie-point moves on a straight line passing through the point (000), and the radius of the sphere varies accordingly. In the methods working with monochromatic X-rays, T is free to move on a sphere of radius 1/λ, the 'wave number sphere'. If there is incidence in all directions with respect to the crystal lattice, as in powder diagrams, T moves over the entire surface of this sphere. 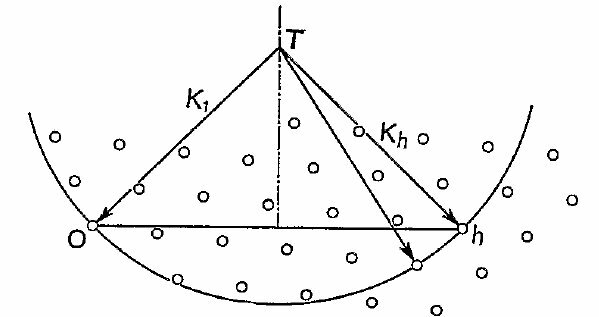 In wide-angle diagrams, T moves only within that part of the sphere that is cut out by the solid angle of incidence. In a rotation or oscillation diagram, finally, T is restricted to a great circle, or part of it, which is normal to the axis of rotation or oscillation. In each case, the process of 'indexing' a diffraction diagram is essentially the reconstruction of this geometry from the diagrams, and it thereby leads to the determination of the shape of the reciprocal lattice. This process is made easier by any additional information obtained about the spots on the diagram. It is hardest in the case of powder diagrams, where nothing is known; the higher the crystal symmetry is known to be, the easier it becomes. Oscillation diagrams are easier to index than rotation diagrams on which more overlapping of spots may occur. It is of further great help to know the position of the crystal at the instant of reflecting each spot of a rotation or oscillation diagram. This is achieved in the so-called goniometer methods by coupling a displacement of the film to the rotation of the crystal and limiting the recording of spots to certain types of reflections by 'layer-line diaphragms', as in the Weissenberg and Schiebold-Sauter goniometers. In the De Jong-Bouman and the Buerger precession camera film and crystal are moved in such a way that the spots appear in a pattern which is a section through the reciprocal lattice itself, so that there is no problem of indexing. In all cases, however, indexing is a routine procedure, once it has been done a few times. Let us add some detail to the geometry of the reciprocal lattice. We go back to the third part of Fig. 6-2(6) which indicates the cross-section of the array of parallel rods normal to the plane of a1, a2. The same is shown in perspective in Fig. 6-2(8) together with the third axis, a3. Two successive planes normal to a3 are shown (which are at distance 1/|a3| from one another), and the points marked in which they intersect the rods. The eight intersections suspend a parallelopipedon which is the repeat unit or cell of the reciprocal lattice. Let us determine its volume. We know already that the ground plan of the cell had an area 1/A, where A was the area defined by the axes a1 and a2. The volume of the cell is obtained by multiplying this area with the height of the cell, OQ. But we know that the resolved part of OQ in the direction of a3, that is, OP has length 1/|a3|. Therefore OQ = (1/|a3|) : cos γ, where γ is the angle POQ. Thus OQ is the inverse of the thickness of the crystal cell, namely 1/( la3l cos γ), and this makes the volume of the cell of the reciprocal lattice the inverse to the volume of the crystal cell. (see the definition of the scalar product on pg. 86). Fig. 6-2(8). 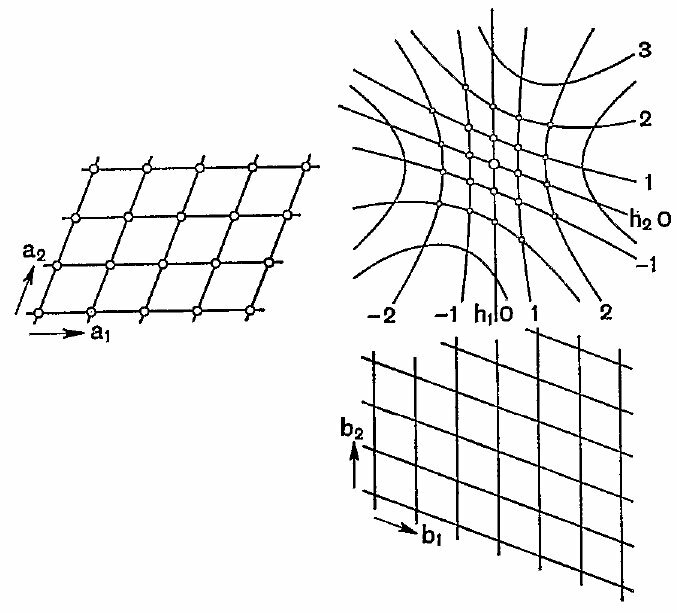 The reciprocal lattice in three dimensions. The origin O is the corner from which the vectors ai and bi are drawn. a1 and a2 are actually shown representing length 1/|a1| and 1/|a2|, and OP = 1/|a3|. Then b1 and b2 are as shown and b3 = OQ. These are the reciprocal vectors to the ai, fulfilling Eqs. (9), and they support the reciprocal lattice. where δik, called the Kronecker symbol, signifies 1 if i = k and 0 if i ≠ k. In this form the equivalence of the two sets of axes appears very forcibly. Just as we obtain the b-set of axes from the a-set, so we construct the a-set from a given b-set. In crystallography, many of the optical or X-ray measurements lead in the first instance to the b-axes. h · (p3 - p1) = (h1b1 + h2b2 + h3b3) · (h1h2a3 - h2h3a1). Because of the relations (9) both products vanish, and this proves the statement. This spacing dh is the one entering in the Bragg formula nλ = 2d sin θ. 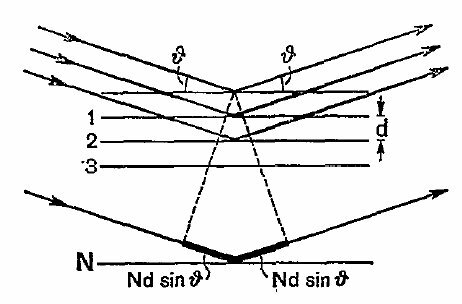 To the vector h = nh* there corresponds the spacing dh/n, or, in the Bragg formula, the nth order reflection on the set of planes. This one-vectorial equation expresses the same facts that are contained in the three scalar equations (6), or in the original equations of Laue quoted on page 50. Fig. 6-2(9). Relation between 'diffracted' and 'reflected' rays. 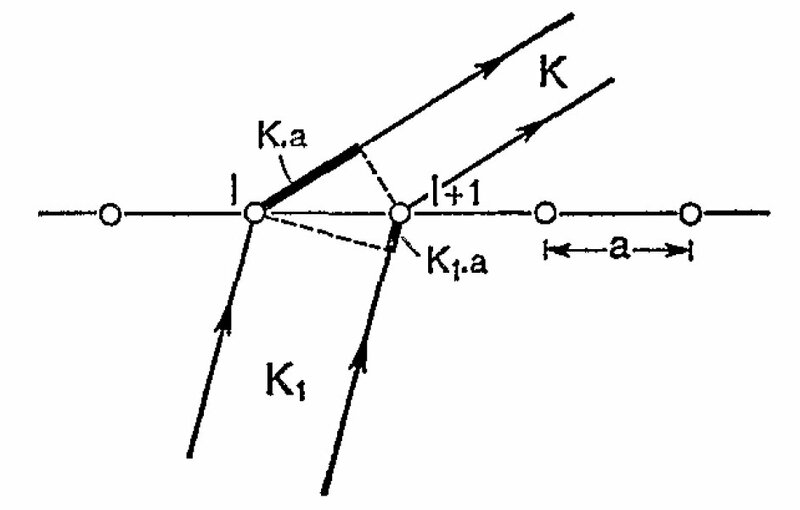 Because k1 and kh have the same length, the plane at right angles to the vector h and passing through its mid-point contains the tie-point. kh can thus be said to be the reflected image of k1 by this plane - and this plane belongs to the set of atomic net planes with Miller indices (h1, h2, h3). This shows that every one of Laue's 'diffracted' rays is simultaneously one of Bragg's 'reflected' rays. So far, the reciprocal lattice has been introduced as a convenient means for visualizing the directions under which alone the perfectly periodic crystal gives diffraction. Since in all these directions the scattered wavelets combine without phase difference, the amplitude generated by a finite crystal in these directions is proportional to N, the number of atoms of the crystal, and the energy, which is always proportional to the square of the amplitude, would be proportional to N2, i.e. to the square of the volume of the crystal if the latter is 'bathed in X-rays. We have already discussed in 6.1 that this is not the intensity which would normally be observed, because the larger the (perfect) crystal, the greater is its resolving power and the sharper its filter action, so that, with increasing N, the angular width of the principal maximum and the spectral range of admitted wave-lengths decreases. If we consider a finite, and therefore in the mathematical sense non-periodic crystal, there is a certain latitude in the fulfilling of the Laue-Bragg conditions, because for a very slight infringement the wavelets coming from the crystal will continue to re-inforce one another. This means that the vector k of the diffracted wave need not end on the lattice point of the reciprocal lattice, as long as it ends nearby, and that in this case the amplitude will be less than the maximum one. We can therefore plot the amplitude distribution in the space between the lattice points, similar to the amplitude distribution shown for the one-dimensional case in Fig. 6-1(2). Again, as in 6.1, the observed intensity may be taken as proportional to the integral value under the principal peak of the energy distribution, which is obtained by squaring the amplitude distribution. The limits of this peak are set by vectors k for which one extra wave-length path difference develops throughout the crystal, beyond that existing when k ends at the lattice point. For then the crystal can be divided into two halves, so that to each reflecting plane in the first half there exists one in the second half whose reflections are by λ/2 out of step with those of the first. If the areas of these corresponding planes were equal, full cancellation would occur; if they are unequal, only a surface effect remains over, instead of a volume effect. Let us assume that the crystal is a parallelopipedon oriented according to the crystal axes, i.e. containing N1 cells along a1, N2 along a2, and N3 along a3. Considering the direction a1, the path difference between neighbouring wavelets is h1λ for the diffraction of order (h1, h2, h3). Therefore between the two extreme wavelets coming from the crystal the path difference is N1h1λ if k ends at the lattice point (h1, h2, h3). If we increase this path by sλ, where s is an integer, we get near-zero field. But this means that between any two neighbouring planes h1 and h1 + 1 of the reciprocal lattice, which have a distance 1/|a1| between them, there are interleaved N1 parallel planes which are the geometrical loci for those wave-vectors k for which the resultant amplitude is zero, or nearly so. The same can be done in the two other directions with corresponding spacings 1/(Ni|ai|). We thus obtain a division of the cell of the reciprocallattice into N1N2N3 subcells whose shape is reciprocal to the shape of the whole crystal. 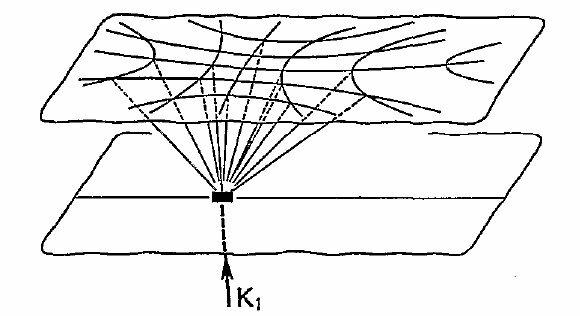 On the walls of these subcells end the vectors k for which the diffracted optical field nearly vanishes; in the interior of each subcell the diffracted amplitude will have a (positive or negative) maximum value, and the intensity distribution a positive maximum, but the height of these maxima falls off rapidly with increasing distance from the lattice point, because an ever smaller fraction of the crystal produces those wavelets which are not cancelled out by others in opposite phase. All this is but the extension of Fig. 6-1(2) into three dimensions. We have now filled reciprocal space with an amplitude distribution which is the same about each point of the reciprocal lattice. Whereas these points themselves are indicative of the crystal lattice, the subcell walls and the amplitude distribution contained between them have nothing to do with the inner periodicity of the crystal; they are, instead, determined by the external shape of the crystal. In fact, they would remain unchanged about the origin point (000) if the external shape were filled with an amorphous distribution of scattering matter - liquid or glassy - , while in this case the reciprocal lattice points outside the origin lose their significance, and with them the surrounding amplitude distribution. The construction of the zero amplitude subcell walls can be obtained easily by what is known in optics as Fresnel Zones. Fig. 6-3(1) shows in a schematic way how the lattice points in reciprocal space are surrounded by the amplitude distribution (the 'shape transform' of the diffracting crystal). The division in the drawing is in twentieths and in tenths of the axes b1 and b2 and the shape of the crystal is indicated in the drawing. This corresponds to a crystal of 20 x 10 cells. 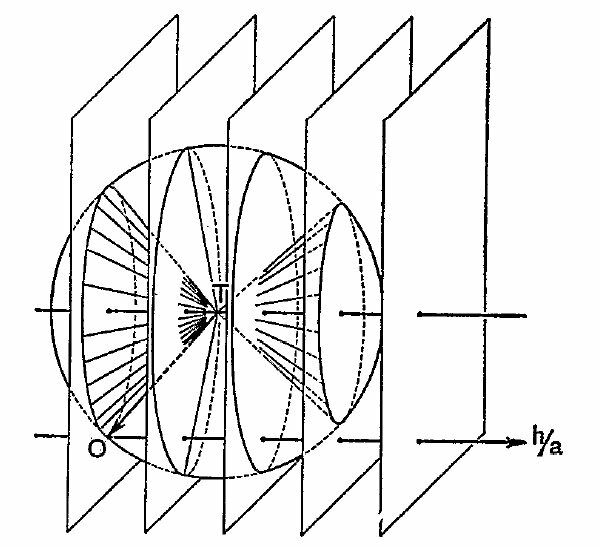 The sphere of reflection intersects the distribution about the origin, and this would give rise to small angle diffraction. Besides, the sphere passes close by two other lattice points and the diffracted field in these orders will be given by the amplitude (or intensity) distribution on the surface of the sphere. In the upper intersection we see that the spot will be split into two parts, where the sphere intersects the two central rows passing through the point (h1, h2, h3) . These rows are principal peaks for either the h1 or the h2 directions, and as such have double width, as we know from the one-dimensional case of 6-1. Such 'intensity spikes' always occur when the shape of the crystal contains relatively large flat faces, and their occurrence is easily understood by applying a Fresnel zone argument. Laue was the first to point this out and to explain the splitting of diffracted spots in electron diffraction pictures of very small and regular, electrolytically deposited metal crystals of octahedral shape. 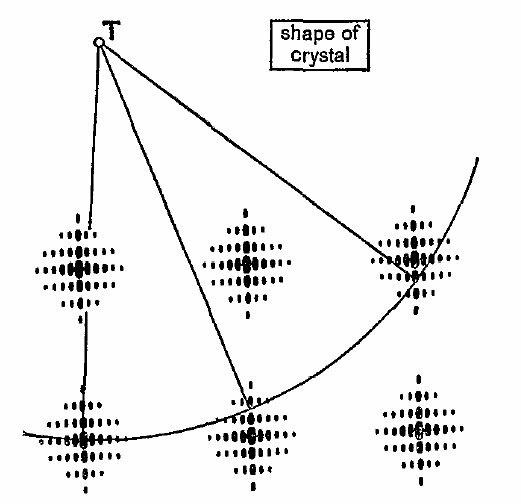 If the crystals are larger, the whole amplitude distribution contracts around the lattice points and becomes unobservable; the integrated value of the intensity remains measurable, and the integration produces the Lorentz factor. Fig. 6-3(1). Amplitude or intensity distribution surrounding the reciprocal lattice points in the case of diffraction by a finite rectangular crystal (Crystal Shape Factor). The above may be taken as an example of the way in which continuous amplitude and intensity distributions can be plotted in the space surrounding the lattice points of the reciprocal lattice. Because this is very closely connected to the mathematical theory of Fourier Transformation, the space in which the reciprocal lattice is imbedded is best called Fourier Space. This gets rid of the term 'reciprocal space', which is a bad term because reciprocity is a symmetrical relation between two things and therefore unsuitable for designating one of them. The modern presentation of the (kinematical) diffraction theory is governed and simplified by the mathematical notion of Fourier transformation. It can be shown that a distribution of matter, or electron density, or any other property throughout the crystal, can be described in two fundamentally different, but fully equivalent ways. One is, to give this function, say ρ(x), point by point in physical space, that is, as a function of the position vector x (or its component numbers x1, x2, x3) . The alternative one is to give, instead, a complete description of all the diffraction effects obtainable from this distribution of mass with all possible wave-lengths, and this means to give the value of the diffracted amplitude F throughout Fourier space, that is for all values of the position vector η = η1b1 + η2b2 + η3b3 in this space. The transition from one description to the other is performed by an integration and is therefore a straightforward mathematical operation to write down, though in many cases difficult to carry out. In the case that ρ(x) is strictly periodic (which includes its extending everywhere to infinity) F(η) is zero except at the points of the reciprocal lattice where η = h; this may be expressed by saying that Fourier space is reduced to an 'index space', namely the points of the reciprocal lattice corresponding to the periodicity of ρ(x). In that case the integral over Fourier space degenerates to a sum, or the Fourier integral to a Fourier series. Since we cannot observe F(η) but only |F(η)| from the intensity |F(η)|2, we cannot perform the Fourier transformation which would lead us back directly from Fourier space to crystal space; instead, the 'Phase Problem' looms large between the two spaces (see also the next chapter).